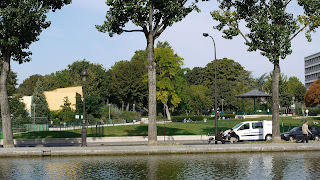 Along the banks of the Canal Saint Martin, on the corner of Rue des Récollets and Quai de Valmy, stands one of the biggest areas of greenery in the 10th arrondissement. Together with the canal itself, it is a haven of peace in an otherwise hectic built-up area. Around 1870, at the time of the Franco-Prussian War, a military hospital was established in a former convent, le Couvent des Récollets. The hospital was installed in this location, strategically close to Gare de l’Est, so the wounded soldiers returning from the front could be treated quickly. The convent building now houses the Order of Architects of the Paris region; the grounds are now the Jardin de Villemin. The garden has four entrances: two on Quai de Valmy; one on Rue des Récollets (through the entrance of the former hospital); and one on Avenue de Verdun (next to Gare de l’Est). For such a relatively small garden, the number of species of tree is impressive: Chestnut, Acacia, Plane, Oak, Birch; and if you look carefully you’ll find several different varieties of Maple. There are also Blackberry bushes, Sophora, a seven-metre-tall Paper Mulberry tree, Cherry trees, an Apple tree and an eight-metre-tall Weeping Willow. A grand old White Mulberry is stretched out across the ground having been laid low by a storm, but it thrives nonetheless. Near it are Rose trees, a Mexican orange tree and numerous decorative bushes: Hibiscus, Abelia, Lavender, Rosemary, Cistus. 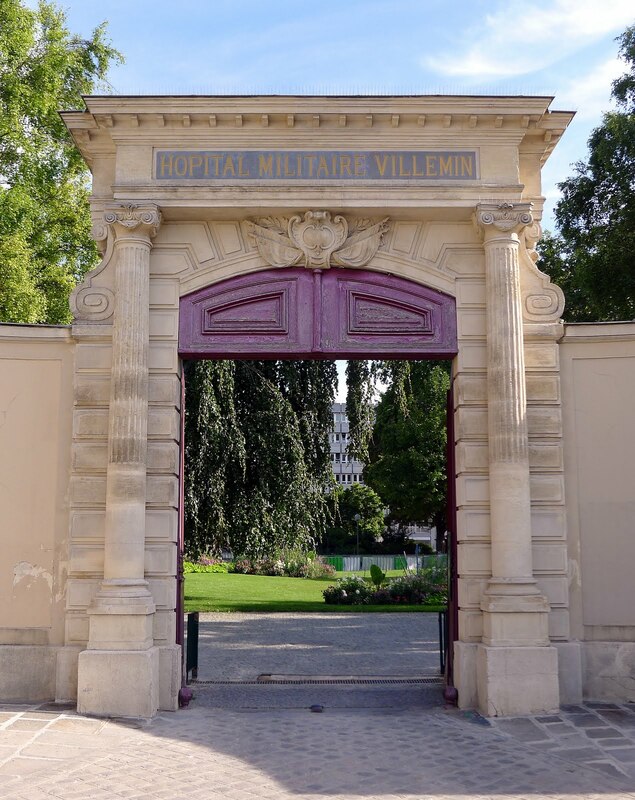 Next to the Rue des Récollets entrance – the only remaining vestige of the old military hospital – there is a community garden managed by a local association. It covers a total area of around 220 square metres and is divided into 50 lots where they grow over 150 varieties of vegetables and flowers. Many local schoolchildren get their introduction to horticulture here, instructed by volunteers, mainly retired people from the area. Special raised boxes allow handicapped people to participate in the experience. 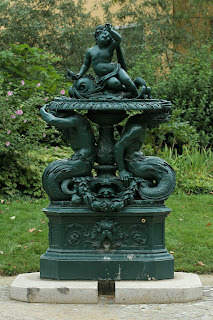 The splendid variety of flora is not the only amenity in the garden. 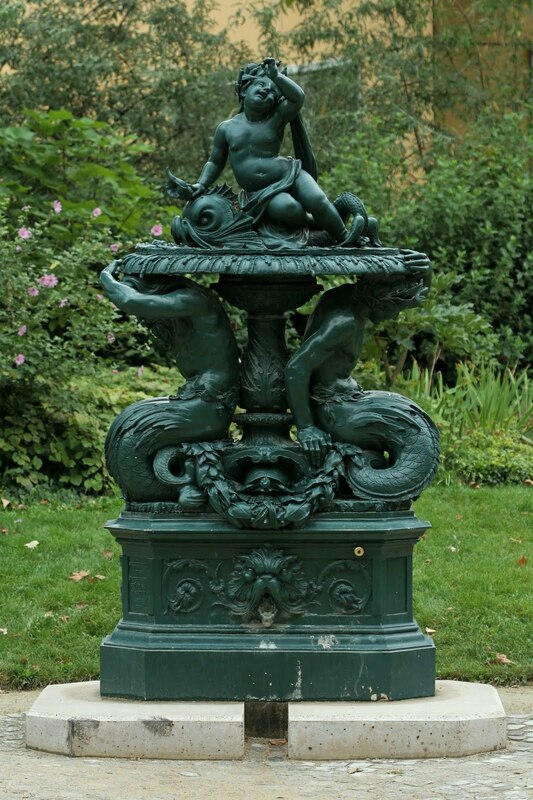 There is a playground for children, a sports area for grown-ups, a pond for the birds, a water fountain for the thirsty, a bandstand for musicians, and a large area of gently hilly lawn for picnickers and sunbathers along the canal side of the garden. Something for everyone! This lawn area was added to the garden in 2000 – but it almost wasn't! There had been a plan to build apartments on the Quai de Valmy, but following a campaign by local residents and associations, the City of Paris bought the plot and cancelled the construction project. This allowed an extension of the garden to its current size with its access to the Canal Saint Martin. There are several pleasant café-bars and restaurants on Rue des Récollets, and a larger brasserie with a terrace facing the Avenue Verdun entrance.